← Ice cream in a bag! 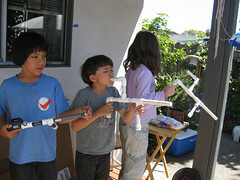 We made another Howtoons DIY project: Marshmallow Shooters out of bits of PVC pipe. It was so amazingly easy! First Moomin and I made a list of the PVC parts we’d need. At the hardware store, we got a few 3 foot lengths of pipe, which was extremely cheap. We also bought enough slip connectors to build 2 guns, and as an experiment, I bought all the pieces to try making a threaded pipe gun as well. It takes a while browsing all the bins of parts to pick out the right sizes, in this case 1/2 inch pipe and connectors, and to make sure all the joints are slip joints, not threaded! We bought a small, racheting, pvc pipe cutter for about 15 bucks. When we got home we laid out the plans and started marking 3 inch lengths of pipe to cut. The pipe cutter was *definitely* easier than using a hacksaw! The best bit of this was: I didn’t have to do anything but provide materials. All of the cutting and assembly was easily done by all the kids who made the shooters, from 5 years old up. Then, Iz came over with a bag of mini marshmallows. She made a gun too. Onward to the great marshmallow shooting! Then our next door neighbor came over too. I had to give up my gun! While the threaded pipe made a decent gun, the parts were more expensive, so I’d just stick with slip joints in future. Everyone wanted to modify their guns and make new things. So we went to the *other* hardware store, the local tiny one, to get more pipe and connectors and ice cream on the way… Pipe was a dollar for 5 feet so I bought 10 feet of pipe and another 10 bucks worth of various connecting bits! We ended up making guns for all our neighbor’s small cousins too. So, if you do this project, I recommend you just buy about 20 feet of pipe and way more connectors than you think you’ll need! Everyone will want one! They shoot marshmallows all the way across our backyard, over the fence, and into the driveway over the cars. There were marshmallows all over the roof. It was epic! The only down side was, with the 90 degree weather we had a lot of melty splodges on the cars and sidewalk. Luckily the kids picked up most of the solid marshmallows, and our baby raccoons and probably some rats and possums took care of the rest by the next day! I think next we may buy a lot more big lengths of pipe to make a huge “marble drop”. This entry was posted in Comics, Projects and tagged crafts, diy, howtoons. Bookmark the permalink. 24 Responses to The joy of PVC pipe: Marshmallow guns! You know what else is fun? Spray painting your marshmallow gun! The most important and prosperous thing of this century is that our knowledge have made our children so efficient, confident and have widen their view towards to world. essay writing service uk It have inbuilt in their nerves to exploring and experiencing different things in their life. Really fantastic! I think this post is really helpful to understand the way how to make such guns that used for playing. I didn’t know that PVC pipes can be used for making such things. Thank you very much for sharing this post! I was learned some tips from this blog. 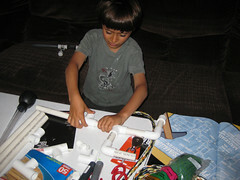 This blog provides some info, that helps to make pvc pipe to be a marshmallow gun. That is really looking like a real gun. So, i will read these steps and services. Everyone wanted to modify their guns and make new things. So we went to the *other* hardware store, the http://www.buywatchestop.co.uk local tiny one, to get more pipe and connectors and ice cream on the way… Pipe was a dollar for 5 feet so I bought 10 feet of pipe and another 10 bucks worth of various connecting bits! Enjoy the ringtones apart from your home ringtones from how to change ringtone in windows mobile for free.